Rio Salado is proud to take part in Constitution Week and to encourage civic engagement among students. 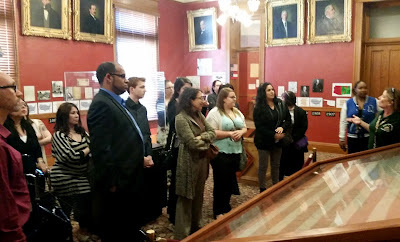 We end Constitution Week with a look back at a special moment for a group of Rio Salado students and staff who took part in a guided tour of the Arizona Capitol last spring. 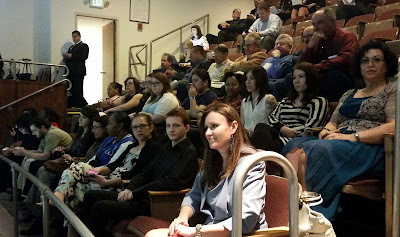 The students were part of Rio Salado’s Adults Achieving a College Education (AACE) program, which is designed to help students prepare for the GED® test while transitioning into college life, by taking college-level coursework and preparatory classes that help them acquire valuable skills they can use in the workplace and in school. The group of 24 AACE students and Rio Salado employees scheduled the tour to get a first-hand view of government in action. What they didn’t expect was a standing ovation from the House of Representatives! 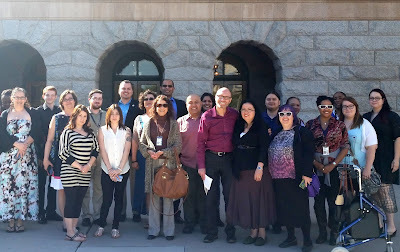 “This was a very informative and an empowering experience,” said Director of Rio Salado's AACE and College Bridge Pathways Workplace Education program Kate Packer, who arranged for the tour of the Arizona Capitol museum and Legislature. Arizona State Representative Mark Cardenas led the discussion, acknowledging the group and providing a brief about Rio Salado’s AACE program, which prompted other members of the house to greet the group with applause and a standing ovation. Representative Cardenas also took the time to meet with students and take part in group photos. “We make it a point to encourage civic participation among AACE students and this is just one way to help students become inspired,” said Packer. Rio Salado AACE is a scholarship-based college and career preparation program for adults 16-years-of-age or older, who are ready to commit to completing a degree, certificate or workforce training program. To learn more visit this web page.